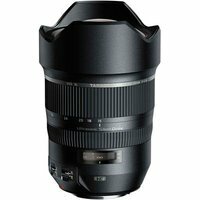 This ultra-wide-angle 15-30mm zoom lens continues Tamron's development of lenses for serious photographers, adding an ultra-wide-angle solution to their line-up of high-quality optics for pro DSLR users. Suitable for full-frame and smaller sensors, the 15-30mm lens incorporates advanced features such as a constant f2.8 aperture throughout the zoom range, along with quiet and fast USD (Ultrasonic silent drive) focusing and water and dirt repellent Fluorine coating on the new XGM front element. This lens is suitable for a wide range of photographic subjects, including landscape, travel, interior, weddings, gigs, and night time photography.